﻿ Dahab Plaza Hotel Dahab. JIMAT di Agoda.com! Ada soalan mengenai Dahab Plaza Hotel? Dibina pada 2002, Dahab Plaza Hotel merupakan tambahan menarik di Dahab dan satu pilihan bijak bagi para pelawat. Hanya sejauh 90 km, hotel 3-bintang ini boleh diakses dengan mudah dari lapangan terbang. Tidak kurang hebat adalah akses mudah hotel untuk ke pelbagai daya tarikan dan mercu tanda bandar, seperti Hands of Dahab Community Market, Wadi Zaghara, King Safari Dahab St. Catherine/Mt. Sinai Trip - Day Tours. Dahab Plaza Hotel juga menawarkan banyak kemudahan untuk memperkayakan penginapan anda di Dahab. Hotel ini menyediakan akses kepada pelbagai perkhidmatan yang luas, termasuklah khidmat bilik 24 jam, Wi-Fi percuma semua bilik, fasiliti tetamu kurang upaya, Wi-Fi di tempat awam, letak kereta berjoki. Hotel-hotel telah direka demi keselesaan dan memudahkan tetamu. Sebahagian bilik menyediakan televisyen skrin rata, internet wayarles, kolam renang peribadi, internet wayarles (percuma), tab mandi pusaran air. Kemudahan rekreasi hotel, yang termasuk seperti pantai peribadi, pusat kecergasan, mandian air panas , kolam renang tertutup, rumah urut direka untuk anda melarikan diri dari masalah dan bersantai. Apa juga tujuan lawatan, Dahab Plaza Hotel merupakan pilihan yang terbaik bagi penginapan anda di Dahab. Thank you for the owner for making me feel so welcome in Dahab. I arrived very late after taking the Go Bus to Dahab, and he was happy to welcome me with a comfortable room, fast Internet, and filling breakfast - all for a very very reasonable rate. I highly recommend this hotel while you are in Dahab. Also, they were re-doing the pool, so I expect it will be even more fabulous very soon. my wife and i spent 5 days here. 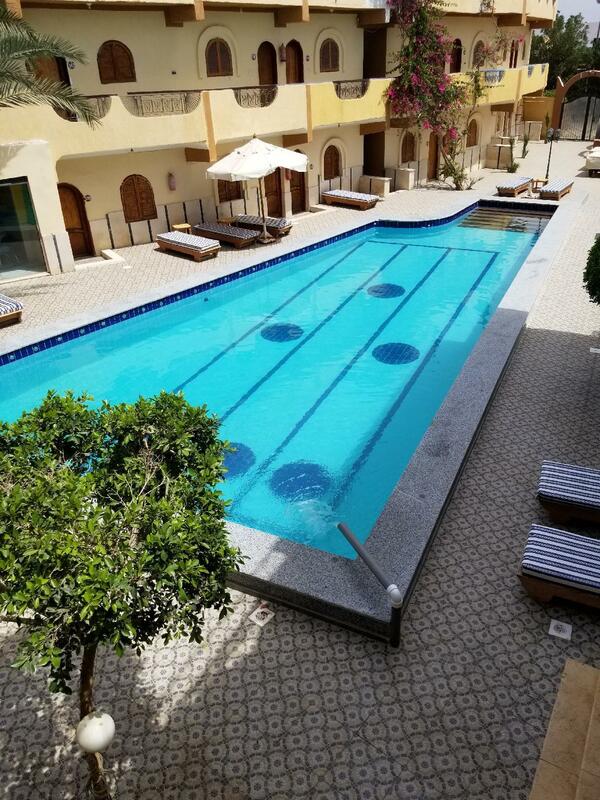 the hotel isn't flash but the room was clean and comfortable and it is well located being a short walk from the beach and almost in the middle of dahab. emad the owner is very helpful and also owns two restaurants on the beach were breakfast (included) can be taken. a discount is available at these for other meals. My husband and I were quite happy after we got over how basic the room was. 2 single beds one night stand, wardrobe,fridge and TV. The room was small, but how much time do you really spend in there anyway. We were on the ground floor and our door led directly to the pool, so there were two lounge chairs just outside our door. The fridge was a bonus as we could buy a few lunch things to keep cold and spend less eating out. Everything was within a 5 minute walk,beach,shops, supermarkets, liquor and beer store, excursions and many restaurants from which to choose. Price were very reasonable at all restaurants and bartering was expected at all the shops. The owner and staff were all very helpful and would go out and get anything you wanted if you didn't want to leave your room. Breakfast was included at one of the beach restaurants. They really took care of me from the moment I walked into the hotel till I left. That they didn't have any restaurant in the hotel. You were guided to a nice restaurant indeed for where to eat your breakfast, but still, that was a couple of hundred meters away. I liked it. 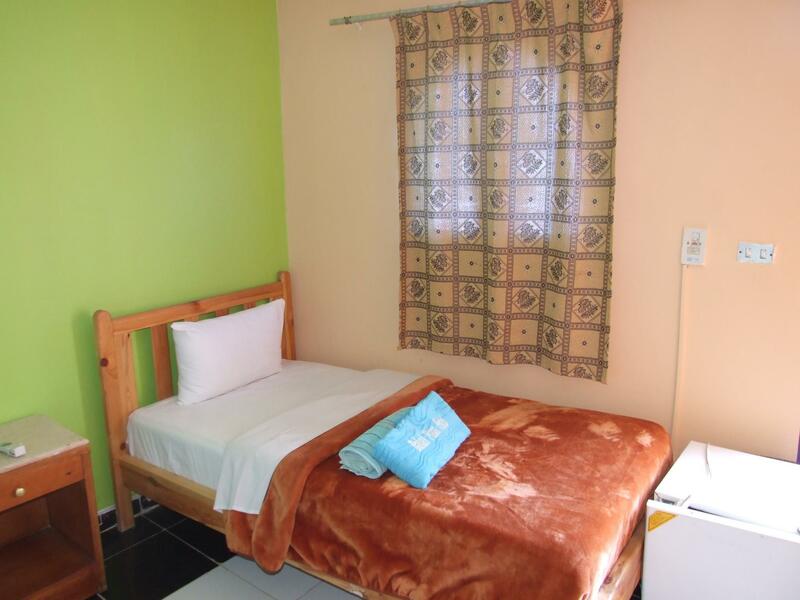 If you want a hotel quite close to the central parts of Dahab this hotel is great. They had wireless internet for free, the room was more or less clean so yeah, overall I had no reason to complain what so ever. Hotel is gelegen in een rustige wijk op ca 5 minuten loopafstand van het strand. Ontbijt wordt geserveerd op 2 plaatsen aan de zee. De verst gelegen gelegenheid(10 minuten lopen) is kwalitatief beter. In het hotel vriendelijk personeel welke ook zeer hulpvaardig zijn. redelijke kamers c.q. badkamers gezien de prijs die wij betaald hebben. Enige nadeel van dit hotel was dat de huishoudelijke dienst beter de kamer moest schoonhouden. Emad the mangager is very friendly and can organise almost anything very quickly and efficiently; nothing is too much trouble. Breakfast is down at the beach at a choice of two places where there is also a 20% discount on meals. The pool is rather small and uninviting and the rooms, bathrooms in particular, could use some updating. his hotel is the ultimate place to stay in Bangkok. Its five star service and accomodation in every respect. Agoda has special rates and its the best value for money in Bangkok. The rooms are huge and well appointed with great views. The Sirucco restaurant on the 64th floor is excellent although over expensive. Il Dahab plaza hotel fa parte della vasta schiera di hotels da primo prezzo che pratica ai clienti di Agoda prezzi piu' alti di quelli praticati ai clienti diretti. Abbiamo incontrato casi simili in Cairo,Luxor,Assuan,Dahab,Petra e ora in Alessandria. Abbiamo pagato in questo albergo lo stesso prezzo pagato in grandi alberghi di Hurgada e Sharm.Ovviamente la valutazione,tenendo conto del prezzo gonfiato e' bassissima.Non ha nessunastruttura campetitiva con gli altri alberghi e anzi ha carenze di struttura,di pulizia,di qualita'del cibo, ecc. E' un albergo molto spartano ,camere piccole,bagno essenziale,la colazione (spartana)si consuma in un ristorante distante qualche centinaio di metri,la spiaggia convenzionata e' distante e abbastanza piccola.Allo stesso prezzoin Sharm risiedevamo in ben altro tipo di albergo.Abbiamo avuto la quasi certezza che iprezziper i clientidi Agoda siano notevolmente superiori a quelli praticati alla clientela diretta. 버스타고 와서 바로 자기에는 좋네요 서비스도 나름 좋습니다. Super fedt ophold, hvor vi fra starten følte os velkomne og godt tilpas på hotellet blandt personale og gæster. Dejlig beliggenhed tæt på starndpromenade, supermarked og gågade/bazar. Udmærket koncept med morgenmad på en restaurant ved vandet. Udemærket hotel for dem, der ikke er kræsne med indkvarteringen. Servicen og personalets venlighed er i top, og hvad angår den udemærkede morgenmad, kan man vælge at få den serveret på to forskellige restauranter, der ligger helt ned til stranden.Man får, hvad man betaler for på dette hotel. Der er ingen luksus som sådan, men værelserne er udemærkede, hvis ikke man er kræsen. Køleskab, vand på flasker og AC på værelset er inkluderet. Hôtel assez simple mais très sympathique avec un personnel aux petits soins, sans être trop pesant. Les chambres sont simples et pas très grandes, mais avec des transats devant la porte auprès de la piscine. Le petit déjeuner, inclus dans le prix de la chambre se prends dans un des deux restaurants dont le patron est propriétaire à quelques encablures de là et sur le front de mer. Très agréable et bon choix dans les possibilités pour le petit déjeuner. Hôtel calme.